Click the chart to track shares of Dollar Tree. With the economy recovering at only a snail's pace, consumers are still feeling pinched and are on the hunt for the best bargains. For many, that now means shopping at dollar stores. 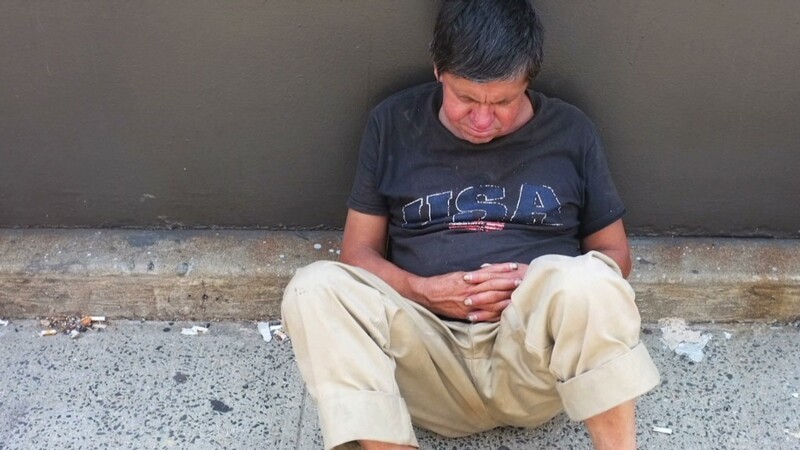 "Massive unemployment and declining wages are squeezing people out of the middle class," said Kristin Bentz, executive director at private equity firm PMG Venture Group. "These people can't even afford Wal-Mart now and are trading down to dollar stores." The decline of the middle class and its impact on retailers was a hot topic at the Stocktoberfest conference last month hosted by social investing site StockTwits. Bentz and Joseph Brusuelas, a senior economist with Bloomberg Briefs, both spoke about the trend. Brusuelas said that many people looking for work are being forced to take jobs in lower wage industries like retail, leisure and hospitality, health care and social assistance. There also has been a rise in companies offering just part-time positions. That shift could be one reason why sales at Wal-Mart (WMT) stores open more than a year declined 0.3% during second quarter. They were also weak at rival Target (TGT) during the same period. 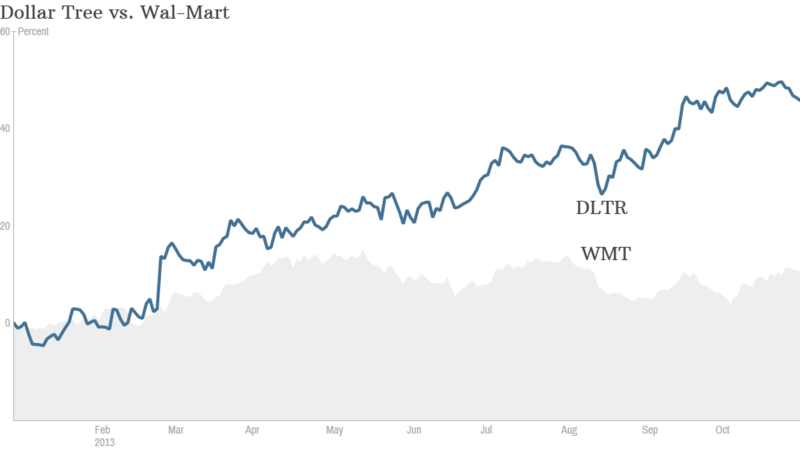 Shares of both retailers are underperforming the market, with Wal-Mart shares up just 14% and Target's stock up 10% compared to the S&P 500's 24% gain this year. Meanwhile, same-store sales are accelerating at discount stores Dollar General (DG) and Dollar Tree (DLTR). Their stocks are up 31% and 44% year-to-date. Dollar stores are taking advantage of their new customers and expanding their offerings, including more brand name products and foods like meats, fruits, vegetables, milk and eggs, said Bentz, who is also president of Talented Blonde, an advisory firm focused on the consumer and retail industry. Dollar Tree is rolling out freezers and coolers at a faster pace, and is on pace to install them in 550 stores by the end of the year. "This category serves the current needs of our customers, drives traffic into our stores and provides incremental sales across all categories including our higher margin discretionary product," said Dollar Tree CEO Bob Sasser during the company's earnings call in August. The same trend is also benefiting drugstores like CVS (CVS) and Walgreen (WAG), said Bentz. Technology is the new fashion statement: Other retailers that have exposure to the middle class are also struggling, namely department stores J.C. Penney (JCP) and Sears (SHLD), as well as teen-focused retailers Abercrombie & Fitch (ANF), American Eagle (AEO) and Aeropostale (ARO). "The management teams of these companies have taken their eyes off the ball--they haven't followed their consumers and how they've traded down," said Bentz, adding that consumers are spending less on discretionary items and aren't willing to pay for brands and labels. Instead, they are turning to lower cost fast fashion retailers like Forever 21, H&M, and Uniqlo. Bentz said that when consumers are still willing to pay for a brand-name label, it's usually for a technology accessory, such as Apple (AAPL) products or Nike (NKE) FuelBands. Ultra-luxury is still booming: While the middle class is downgrading to lower cost retailers, the wealthy are still buying high-end luxury items. That's because while the middle class has been struggling, the top earners have benefited most during the economic recovery, pocketing the bulk of income gains and welcoming rising home values and gains in the stock markets. That's why designer brands like Michael Kors (KORS) and the ultra high-end brands like Louis Vuitton (LVMHF), Burberry (BBRYF), Prada (PRDSF), Hermes (HESAF) and Christian Louboutin are attracting shoppers. "For these brands, there's no substitute," said Bentz.